One of the best ways to experience the monsoon-fed greenery of the Western Ghats, this night trek to Kothaligad will showcase some of the most mesmerizing landscapes of dense forests and tall mountains. Under the dark cover of the night, you will begin trekking on narrow nature trails and climb up to the pinnacle to witness a beautiful sunrise. As you reach the Kothaligad fort, you will climb the final stretch of the trek on stairs carved into the mountain. At the fort, you can explore the ancient ruins of Kothaligad with caves, carvings, temples, pillars and cannons that date back to the 13th century. This is a relatively easy trek of 3 hours, making it perfect for fit beginners as well as experienced trekkers. Perched atop a towering hill, Kothaligad is a small fortress dating back to the 13th century. There is a small temple and a large cave at the bottom of the fort where trekkers to Kothaligad often stop to rest. At the pinnacle, the ruins of fort offer historical insight into the Maratha empire. Ancient pillars, carvings and artefacts that have stood the test of time are worth exploring. The trek to Kothaligad is a relatively easy trek that takes you over a well-defined trail and over a staircase carved into the mountain. Few sections of the staircase that have withered away require careful climbing, especially in the months of monsoon. 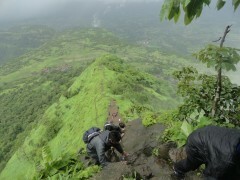 • Trek to Kothaligad and climb up to an elevation of 3,100 feet. • Watch a beautiful sunrise from the pinnacle. • Climb up a steep staircase to reach the top. • Explore the ruins of the Kothaligad fort. Travellers are required to adhere to the instructions of the trek leader during the trek to Kothaligad. 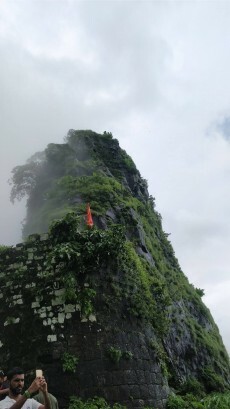 Consumption of liquor, drugs, tobacco products and cigarettes is strictly prohibited during the trek to Kothaligad. For cancellations made 7 days or more before departure of the Kothaligad trek: 85% refund. 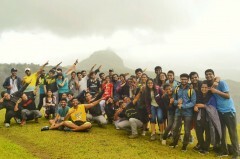 For cancellations made less than 7 days before departure of the Kothaligad trek: No refund. 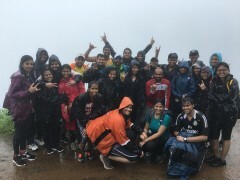 A basic level of health and fitness is required to book this trek to Kothaligad. If you have any cardiac or respiratory conditions, or suffer from knee or spinal problems, please inform the tour operator and consult your doctor before booking this trip. Travellers are requested to arrive at Karjat Station by 23:20 hrs. Tardiness in reaching the pick-up point will lead to missing the trek. The tour operator takes utmost care to ensure safety of the travellers and shall not be held responsible for any mishap, accident or loss of life during the trek to Kothaligad. Karjat Railway Station at 23:20 hrs. Karjat Railway Station at 11:00 hrs. Make sure you arrive at the Karjat railway station by 23:20 hrs. 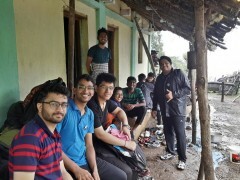 If you're late and reach Karjat after the group has departed, you will miss the trek. At Karjat, you'll meet the rest of your trekking group and the trek leader. After a short briefing session, you'll board private vehicles that will drive you to the base village of Ambiwadi. Enjoy the night ride that will take you through the countryside along farms and villages. You'll arrive at the base village of the trek, Ambiwadi, after a short 30-60 minute drive. Climbing your way to the top. Day 2 of the trek to Kothaligad: Conquer Kothaligad! You'll reach Ambiwadi, the base village for the Kothaligad trek, and prepare for the 3-hr trek ahead of you. Under the stars of the night sky, you'll begin trekking from Ambiwadi and pass through rich monsoon-fed greenery. En route, you'll take a few halts and reach the pinnacle of Kothaligad by early morning. Here, you'll take some rest after an exhausting trek before setting out to explore the ruins of the fort. After admiring a beautiful sunrise from the top of Kothaligad, you'll begin your return journey back to Ambiwadi. You'll retrace your initial route and reach Ambiwadi for a scrumptious breakfast. You'll leave for Karjat railway station in private vehicles and reach by 11:00 hrs. Your trip ends here. Arrive at the Karjat railway station by 23:20 hrs and begin your drive to Ambiwadi. Common washrooms and changing room facilities will be available at Ambiwadi. Since no meals are included in today's package, you may want to have dinner before reporting at Karjat railway station. After exploring the Kothaligad fort and admiring a beautiful sunrise in the morning, you'll trek back down to Ambiwadi. Today's meal package includes breakfast at Ambiwadi before you depart for Karjat railway station. Karjat railway station is connected to the Mumbai Suburban railway system. You can board a train from any of the railway stations in Mumbai and travel to Karjat. The tour operator will arrange your transport to the start point of this trek.